Description: Hand signed by artist. Artwork is in excellent condition. Additional pictures available upon request. Frame size: 17.25 X 16 inches. 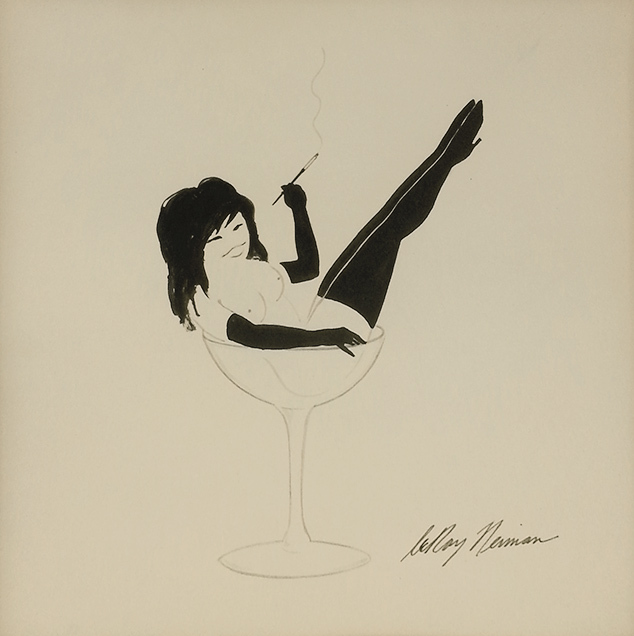 Femlins were created by LeRoy Neiman in 1955 when publisher/editor Hugh Hefner decided the Party Jokes page needed a visual element. The name is a portmanteau of "female" and "gremlin." They are portrayed as mischievous black and white female sprites, apparently ten to twelve inches tall, wearing only opera gloves, stockings and high heel shoes. They are usually drawn in two or three panel vignettes, interacting with various life-sized items such as shoes, jewelry, neckties and such. Femlins have appeared on the Party Jokes page in every issue since their creation, and were featured on the magazine's cover numerous times, either as drawn by Neiman or in photographed tableaus of sculpted clay models.